Right off the road in Ottawa Lake, Michigan sits a roadside farm stand that is home to Gust Farms Summer Market and CSA. With multiple stands and wagons, patrons will find everything they need to satisfy their summer produce needs. 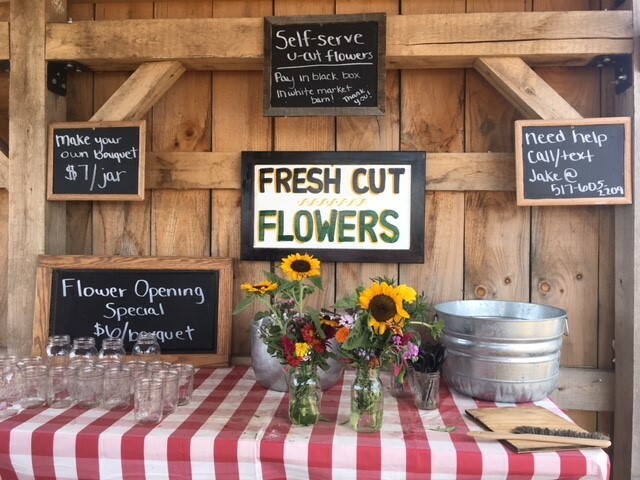 Aside from strictly produce, Gust Farms offers fresh cut flowers, allowing customers to roam the lush rows of flowers in the garden to pick and arrange their own bouquet. While farmer Jake Gust runs the market and CSA only during the summer months, the fun can continue throughout the fall with Gust Brother’s Pumpkin Farm located just down the road from the smaller summer market. The Pumpkin Farm runs from early September through the end of October and is highly attended and enjoyed each season! Jake Gust grew up immersed in farming through his family’s traditional commodity farming roots as well as the pumpkin farm that was busy throughout fall. With a background such as his, agriculture seemed to be in Jake’s life plan. He attended Michigan State University majoring in Agriculture Education before coming back to Ottawa Lake to work and start a family. Jake currently teaches agriculture and FFA (Future Farmers of America) at Whiteford High School. He also has a wife and two beautiful young sons. Due to having the summer off of teaching, Jake decided to dedicate time to farming and while his father and brother focus on livestock, commodity farming, and the pumpkins, he wanted his own agriculture niche. In the summer of 2007 he started selling produce at Farmer’s Markets before eventually deciding to start his own summer market. Then in 2013 he expanded his market into the successful CSA program he has today. Back in 2013 he started with 30 members but today, 6 years later, he currently has over 150 members who partake in the CSA program. There is a unique aspect the Gust Farms CSA program offers, and that is members are able to come out to the summer market stands to fill their own CSA needs. After a few years of pre-filled CSA boxes, Jake switched to a “pick your own” CSA mentality. He provides customers with canvas bags and members can fill up either half a bag or a full bag, weekly or biweekly, depending on the plan that fits their needs and wants. This allows customers to pick their favorite produce, try new produce, or fill their bag with their weekly meal plans in mind. The CSA runs for 10 weeks through the summer and with the CSA subscription customers get 1-2 weeks of fresh cut flowers along with that and have the opportunity to add on additional weeks. Though anyone can stop out at the summer market and purchase flowers or produce whenever they want, the CSA offers an opportunity to support a local farmer by agreeing to a set share of the summer harvest before the season starts. Jake Gust loves being able to provide the community with fresh produce and getting to know the individuals and families that come out to the stand. “The community’s support means so much to me. It means a lot that people trust me to grow their food and to come out and support me and my family” says Jake. While the community’s support has been wonderful, Jake loves the opportunity to use his summer farm and business to teach his students during the school year. With having a full time teaching job, Jake knows how hard it would be to expand his 10 week season but loves the idea of expanding the summer market in terms of the types of produce they grow. There is a lot that Jake loves about farming but the connections to his members and customers as well as using it as a teaching tool for students has been his favorite aspects. While most of the vegetables are grown right at Gust Farms, other local farms are utilized for supplemental produce during certain times throughout the summer. These local farm partners include Horkey Brothers in Dundee, MI and Fusilier Family Farms in Manchester, MI. This allows Gust Farm to provide customers with a wide variety of fresh, local produce at all times throughout the summer season. There is a lot to experience at the Gust Farms Summer Market so be sure to stop over sometime throughout the summer and pick up some favorite produce or fresh bouquet of flowers! Whether you are looking for a summer long commitment to weekly or biweekly shares of produce or just the occasional stop in for flowers and produce then Gust Farms is the perfect spot to go. The summer market is open daily from 10:00am-7:00pm while CSA pick-ups are set for Monday and Thursday evenings from 4:00-7:00pm. The summer markets, as well as the Pumpkin Farm, are very active on Facebook and Instagram, which can be used to keep up on all the lasts happenings around the farm. For more information on the CSA program head to their website at https://www.gustbrothers.com/csa--summer-vegetables.html.